Ditto on reading more McGrath. Have you read Spider or Asylum (or seen the film versions)? I got short stories and Asylum but haven’t read Asylum and only one or two stories and haven’t seen Spider either. Has Asylum also been made into a movie? Yes, and it’s a really good film at that. Hope you can find a copy. I really really want to read that. Thanks. I loved Rebecca when I read it years ago and I’ve seen the film version too. I didn’t like Jamaica Inn as much. “men marry women they hardly know while they are holidaying in Europe” : isn’t that a recurring theme in Anglophone literature ? I don’t remember that as being a plot ingredient in French novels. “He’s taught the alphabet by using swearwords, and they live in an all-male household as Ambrose will brook no female servants” Very funny and eccentric indeed. I suppose it may be easier sometimes to live with no women around. I’d hazard a guess that you’d enjoy My Cousin Rachel. I can’t think, offhand, of any other books in which British people marry while in Europe. I expect there are lots–I just can’t think of any at the moment. But I can think of lots of books in which Women go Wild in Italy. Just finished The Roman Spring of Mrs Stone, so that may have something to do with it. In the book, when the news drifts back to Cornwall that Ambrose is spending a lot of time with this Contessa, there is a great deal of speculation about what she’s like. Is she old? Beautiful? Sensible? Or just a fellow avid gardener? And then, of course, when Ambrose marries her, everyone is astounded as he never thought much of women. There’s the implicit idea that Rachel must be a rare woman indeed. I can’t either, but I can’t erase the feeling of several déjà vu. I have in mind blurred memories of servants expecting a new mistress or talking about a new mistress coming from abroad. Like in Jane Eyre. I’m sure there’s a book by Agatha Christie with that, but I can’t recall the title. And one of the Maugham short stories I read recently evoked this too. Of course, if a man so decided against marriage marries someone, the relatives and acquaintances can only think that the woman (l’heureuse élue, as we would say in French) is exceptional enough to catch his attention or that the man was actually dying to meet the “right woman” (if such a concept is relevant) but not willing to acknowledge it or the pain of being a bachelor. I know what you mean. I’ll obsess on the topic and see if I can think of any titles. Yes, everyone thinks Rachel must be exceptional (as you say) to catch Ambrose’s attention. Sounds interesting Guy. I’ve been thinking of buying DuMaurier’s short stories for a while without being able to commit. Funnily, Rebecca & Jamiaca Inn don’t interest me much. The NYRB version with the Patrick McGrath intro looks interesting. I don’t have it, but I have read several of her short stories. It’s interesting that someone had the wit to flesh out The Birds & Don’t Look Now into films. I wonder if there’s some original quality in the books that accounts for the uniformly high standard of the adaptations. Then again, having Hitchcock and Roeg use your stuff as inspriation probably helps in the transition. I didn’t know NYRB did an edition of the stories, I had looked at a Penguin one. Interesting to compare. I think some writers have cinematic qualities to their work that makes them eminently adaptable. That hit me when I reread My Cousin Rachel. It ached for a film. If I read Elmore Leonard (strange comparison), his books often read with the clapboard in plain view. Well, to me at least. I’m interested in the NYRB version for the intro. When I first read My Cousin Rachel, I took Philip’s story at face value, but now I see that he’s well … a bit warped. So I’d be interested to see what McGrath has to say about du Maurier. I wouldn’t have connected him with du Maurier before this re-reading, and now after seeing him pop up in the NYRB intro, I think perhaps I’m not the only one to see the connection. Du Maurier seems one of those writers who were huge but are now neglected. It’s curious how that can happen (though Kersh and Hamilton went through similar trajectories). It does sound rather good. How long is it out of interest? My copy is an old very plain version from the 60s. No cover. It runs to 288. I picked the cover I liked the best for the post, and there were a lot to chose from. The novel has a very claustrophic feeling (all told from Philip’s view point and I’m still mulling over the unreliable narrator). The claustrophic atmosphere could be compared to a gathering storm–you know the sort of thing when the weather becomes still, the sky dark and cloudy and the pressure seems to gather for the inevitable thunder and lightening. Thanks, I hope to get to more du Maurier novels eventually. It was great to see this review as I have a minor du Maurier reading project in place — I’ve read Jamaica Inn and plan to follow with Rebecca, Frenchman’s Creek and this one (reading them in order of publication). I suspect there will be a six-month interval between books, but it is heartening to know that the last novel in my plan looks like it will appeal to me. And I will admit that part of the reason for the plan is my affection for the scenery in a couple of DVD series (Doc Martin and Wycliffe) that fed my decision to get acquainted with an author whose name I certainly know but somehow haven’t managed to read yet. Are you going to watch the films too, Kevin? My Cousin Rachel (OOP) is available on Amazon through their video-on-demand programme. I can’t say that my experience with Jamaica Inn left me eager to watch a film version. I’ll see about the others after I’ve read the books. My memory of My Cousin Rachel (the film) is positive, but it’s been years since I saw it. Jamaica Inn could do with a re-make, I agree. 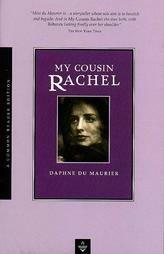 I believe My Cousin Rachel is indeed the stronger novel when discussing the story against Rebecca. Philip is a victim of his own decisions not one of circumstance and character as finds the new Mrs de Winter. I believe the Richard Burton film can be found on YouTube. I’ve re-watched the film since posting this. It’s good to know that it’s on youtube. I’m intending to watch Hungry Hill soon.